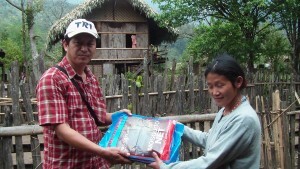 Buzz Off is continuing to distribute LLIN Nets in greater Myanmar. Recently we receive 100 LLIN nets and have been distributing them through the networks that we have set up through the Malaria seminars we have been running in-country. These nets were distributed in Kachin State a risky place where there have been much fighting between the government and ethnic resistance. Your donation to Buzz Off will help us to distribute LLIN nets into needy communities in remote areas in Myanmar, Thailand, PNG, Africa, East Timor and Indonesia. Donations can be made here.